Except for the items provided with permission to the author of this Site, this complete Site is Copyright ; 2000 - 2019. All Rights are Reserved. 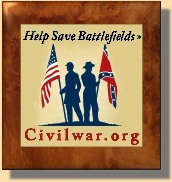 No portion of this site, including this index page and any of the separate pages, may be copied, retransmitted, reposted, duplicated or otherwise used without the express written permission of USA Civil War.com.